I love when I come across a new brand that really fits my style. Well, before visiting Crush Boutique in Scottsdale, AZ last month, I had never heard of Jen’s Pirate Booty – and now I’m in love with the collection (and that boutique)! The pieces I have worn from the brand are so unique and fit true to size, which is definitely a plus. This blue bandana print maxi skirt and matching crop top is such a fun look for the summer. You could easily wear it out for a daytime look, or dress it up for an evening event! I also love that you can wear the pieces separately and still make a statement. 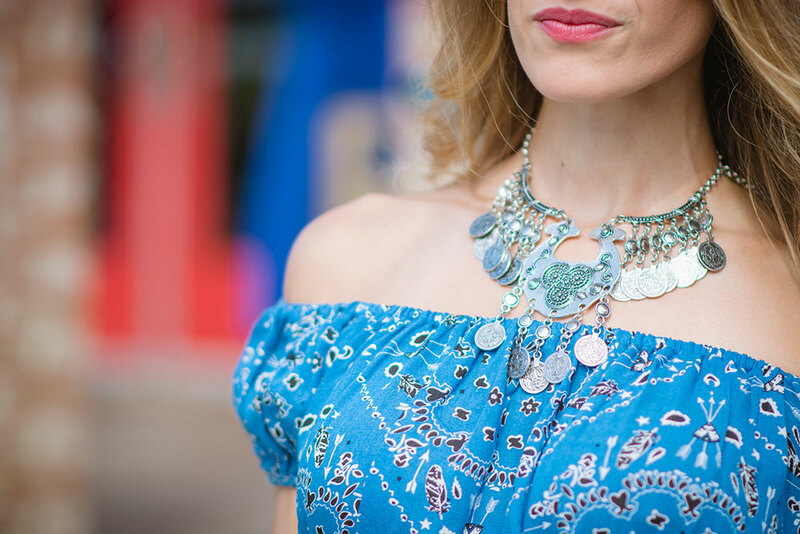 I accessorized with this amazing necklace from Vestique that you could wear as a choker (like I did) or much longer. It’s always a good idea to have statement pieces like this one in your jewelry collection! Shop this look for less below! What are some of your favorite summer go-to looks?